In the middle of Chicago is a campus of 18 buildings on 31 acres of land. On it sits Misericordia Home, an organization that “supports individuals with developmental disabilities in maximizing their level of independence and self-determination with an environment that fosters spirituality, dignity, respect and enhancement of quality of life”. Misericordia Home has been responding to the needs of children and adults through residential, educational and medical services since 1921. Inspired by the example of other full-time, faith-based service programs in the Chicago area, Residential Administrator, Joe Ferarra, sought to create an AmeriCorps program at his place of work and turned to Catholic Volunteer Network. He also told me that for many years Misericordia Home had a fitness room and pool, but lacked the capacity to formalize a fitness program for their residents. 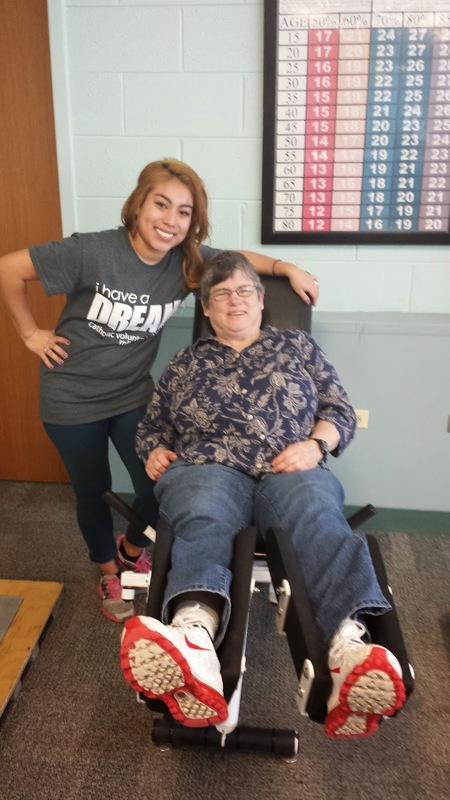 AmeriCorps members Katie Komale and Debbie Gleason have taken charge of creating regular exercise routines for residents of all abilities. Thank you Debbie, Katie and all Misericordia Home CVN AmeriCorps members for your commitment to healthy futures!